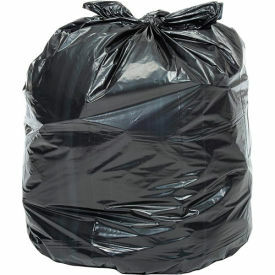 Choose Global Industrial Heavy Duty Black Trash Bags for medium to heavy trash loads, including food scraps, office waste and light cleanup jobs. Ideal for building maintenance, industrial applications, educational institutions, food service scraps, outdoor receptacles, public parks and recreational areas. Manufactured from Linear Low Density Polyethylene(LLDPE) resins, the bag's 1.7 Mil thickness offers maximum puncture and tear resistance. Certified minimum 96% recycled material, which conforms to many municipalities' environmental regulations. Star seal bottom provides optimal fit to receptacle, even load distribution and superior leak protection. Black color helps to conceal waste. Each bag measures 41in. x 52in. for a superb fit into 55 Gallon brute style receptacles. Packaged in coreless rolls, which simplifies inventory control, distribution and accountability. One case contains 5 coreless rolls of 20 bags each for a total of 100 bags per case.